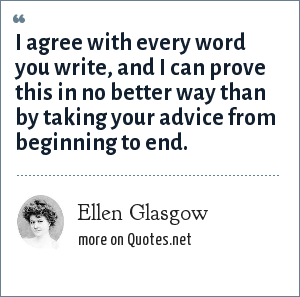 Ellen Glasgow: I agree with every word you write, and I can prove this in no better way than by taking your advice from beginning to end. "Ellen Glasgow Quotes." Quotes.net. STANDS4 LLC, 2019. Web. 23 Apr. 2019. <https://www.quotes.net/quote/7785>.